Pictured below is a five channel thermometer which is destined to be used as a part of a ground source heat pump heated underfloor heating system in Cyprus. This system has an 11kw ground source heat pump with a 160 litre hot water cylinder (HWC). Soon 4 square metres of solar thermal panels will be added to heat a 300 litre thermal store (TS). The whole system has been put together by an experienced plumber using tapstats to control the flow of heated water depending on its temperature – no electronic controllers at all. He did however have the need for a way to easily monitor the temperature of the water in the two large vessels. The two vessels have been made with pockets in them for temperature sensors – two for the hot water cylinder (one at the top and one at the bottom), and three for the thermal store (for sensors at the top, middle, and bottom). 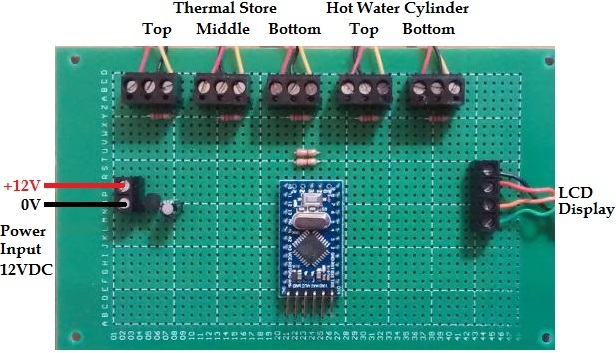 We used our usual waterproof DS18B20 temperature sensors for this thermometer as they have proven to be accurate and very reliable. If you need any kind of digital thermometer, thermostat, or data monitoring / datalogging device, email neil@reuk.co.uk with details of your requirements.